Noruz, the Zoroastrian New Year and the first day of spring, is celebrated by Iraq's Kurds every year on March 21. The holiday is a much bigger deal next door in Iran  ancient Persia is the birthplace of the Zoroastrian religion, and the government practically shuts down for weeks. 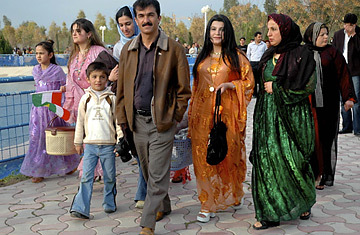 The Kurds are given fewer days off and hold fewer rituals, but Noruz remains an important holiday, in part because it is used to commemorate one of the founding myths of Kurdish identity. Legend holds that Kowa, a blacksmith's son, killed a child-eating giant and, after slaying the beast, lit a fire to signal his terrorized people that they no longer need live in fear. Nowadays Kurds, the descendants of Kowa, light fires during Noruz  often by burning tires  as a symbol of resistance, independence and survival in the face of tyranny. They also do some serious picnicking.